Comments from buyers: “Fantastic packet!!!! Thank you for making October wonderful for my students!” “My students were very engaged in this mini book! 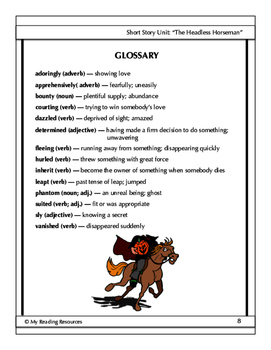 Great resource!” “Thank you for simplifying this story for lower grades!!! I cannot wait to use this with my 3rd graders! !” Your students will have fun reading this adaptation of a classic ghost story for Halloween – or anytime! A spooky favorite Halloween story adapted by My Reading Resources for young readers! 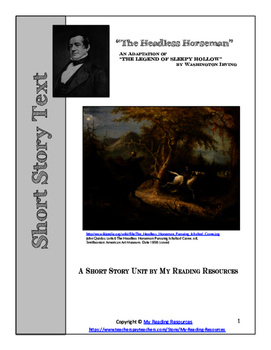 It’s a shortened and simplified version of the famous “The Legend of Sleepy Hollow” by Washington Irving. Lexile 610 Flesch-Kincaid 3.6 - perfect for grades 2-4! 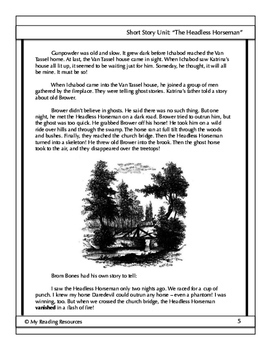 This is a 33 page Common Core aligned complete short story unit. The text is adapted from “The Legend of Sleepy Hollow” by Washington Irving. 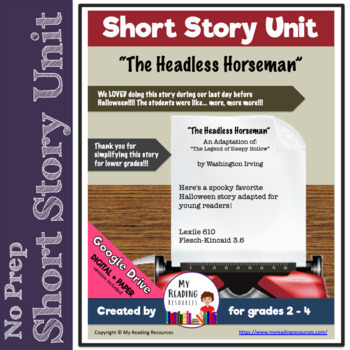 This short story teaching unit has everything that you will need to teach and assess the story. The Table of Contents makes finding information quick and easy.